Desperate to win reelection, Israeli Prime Minister Benjamin Netanyahu stripped off Israel’s mask and exposed the ugliness that has deformed his country over the past several decades. He abandoned the subterfuge of a two-state solution, exposed the crass racism that underlies Israeli politics, and revealed Israel’s blatant control of the U.S. Congress. For years, these realities were known to many Americans, but – if they spoke up – they were condemned as anti-Semites, so most stayed silent to protect their careers and reputations. But – given Netanyahu’s brazen admissions – the American people may have little choice but to finally take notice of this troubling reality and demand a change in U.S. policy. The truth is that the two-state solution has been a fiction for at least the past two decades, dying in 1995 with the assassination of Prime Minister Yitzhak Rabin. But the two-state illusion still served important political purposes both for Israelis, who would pay it lip service while continuing their steady encroachment on Palestinian lands, and for U.S. politicians who could point to the mirage as an excuse not to pressure Israel too hard on its human rights violations. Yet, whenever any U.S. official actually tried to reach that shimmering oasis of a two-state solution, it would recede into the distance. Then, the Israelis would rely on their friends and allies in the news media and politics to blame the Palestinians. 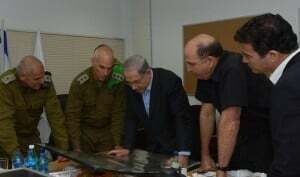 Now, however, the illusion of Israel seeking such an outcome in good faith has been lost in Netanyahu’s anything-goes determination to keep his office – a case of political expediency trumping strategic expediency. In the closing days of the campaign, Netanyahu promised that as long as he was prime minister he would block a Palestinian state and would continue building Jewish settlements on what international law recognizes as Palestinian land. Then, last weekend, a prominent neoconservative Joshua Muravchik admitted that the almost certain outcome of Netanyahu’s scuttling of the negotiations would be to bomb Iran. Muravchik laid out this scenario in a Washington Post article headlined “War is the only way to stop Iran” in print editions and “War with Iran is probably our best option” online. “What if force is the only way to block Iran from gaining nuclear weapons? That, in fact, is probably the reality,” Muravchik wrote. The American people now have little choice but to recognize that Israel intends to maintain and expand its “Jewish state” pushing the Palestinians into isolated enclaves. For nearly a half century, Israel has exercised effective control over these indigenous people in the West Bank and Gaza (totaling more than 4 million people), but there was always the hope of a Palestinian state. Now, by jettisoning the prospect of a “two-state solution,” Netanyahu will institutionalize what had long been the unacknowledged fate of the Palestinians. In essence, Netanyahu is opting for a one-state solution, just with most Palestinians confined to a state-less netherworld where they will be denied political rights, left to wither and die. But rational Americans are confronted with a difficult moral choice. Either continue supporting Netanyahu in brutalizing the Palestinians and in his looming war against Iran (using the U.S. military to carry it out) or insist that the U.S. government reassess its relationship with Israel. The developments of March 2015 – from Netanyahu’s proconsul-style speech before the U.S. Congress to the racist incitements of his victorious campaign – have forced thoughtful Americans to abandon their longstanding excuses for Israeli behavior. From now on, there’s no pretending that “standing with Israel” doesn’t mean kneeling in an obsequious acceptance of Netanyahu’s cruelty toward the Palestinians and cooperation in an illegal and aggressive war against Iran.